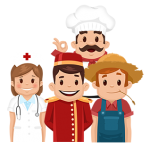 Our avatars do not require any staffing or overseeing by humans. Avazilla automatically recognises which page of your website your visitors are browsing. Let your avatar & speech balloons do the job for you. Your avatar conveys your message in speech bubbles. Your virtual assistant will tirelessly work around the clock without demanding any salary from you. They are always at your disposal to boost your sales. Avazilla is a fully customisable, innovative online sales and marketing tool. Let’s give a chance now both to Avazilla and to yourself, and boost your sales with this revolutionary online marketing tool. Despite the growth of internet day by day and although new ideas emerge and get implemented every day, fundamental issues still remain as problems. How can I attract more visitors to my website? How can I keep visitors on my website for longer durations and make sure that they see and read what I want to explain? How can I establish a better interaction? How can I increase my sales? How can I make a difference ahead of my rivals and so on and so forth. This list goes on and on. Yes, it is true that the internet is growing and developing, but people’s habits and cognitive styles do not change at the same pace, on the contrary they usually remain the same. For instance, the location of menus almost does not change at all. On shopping sites the shopping cart stays always on the right. And the login, register, sign-in and sign-up buttons are usually on the upper right side. And there are things in human nature that will take a long time to change or perhaps will never change, such as the love for cartoons and the effect of speech balloons. It is this love of the human nature and the effect on it that Avazilla has taken as its starting point. Like everyone else has done, you too have tried many different things on your website up to now, and could have got no yield from some of those and less-than-expected yield from some others. Maybe is it time that you give a chance to Avazilla and try it now? Yes. Wouldn’t it be bad to convey your messages to your visitors through the warm effect of speech balloons in a more easy way by pre-setting them and winning your visitors’ sympathy by presenting those to them just when they are supposed to appear? Now let us admit this. How many of us read all the written stuff from the beginning till the end when we are looking into a product, service or something else on the internet? Aren’t we skipping hundreds of important details when we just glance through it instead of reading the whole thing? Wouldn’t it be great to communicate through speech balloons the pre-defined messages that you want to convey to your visitors easily, spot-on and in a way that will arouse your visitors’ sympathy with the help of Avazilla, its cartoons and by benefiting from the warm effect of cartoons? Hey, do you know that we have a free delivery offer for this week? The same product is available also in blue colour. You can click here to see it. Moreover, Avazilla automatically recognises which page of your website your visitors are browsing. On Avazilla admin panel you can pre-define each of your messages that you would like to convey on each page of your website. There, you can also choose your Avatar and set as you prefer the parameters such as timing, colour, how many times it should repeat etc., which you may need. Avazilla does not require any coding expertise to use it, and it supports all languages. it is beyond and far ahead of dummy chatbots. A chat bot would assist your visitor only upon the visitor’s decision and initiative to consult the chat bot. At that stage, such a visitor is one that is already interested in what you offer. A chat bot will not incite interest in the case of an indifferent visitor. Unlike a chat bot, Avazilla helps turn an indifferent visitor to one that is interested in what you offer. A chat bot alone will not decrease your website’s bounce rate and it cannot increase your website’s conversion rate on its own. Your Avazilla virtual agent, on the other hand, launches itself on its own and with its appearance that appeals directly to human senses and with the relevant message that it delivers to the visitor in congruence with the content of that particular page, it decreases your website’s bounce rate and increases the conversion rate. Chat bots are unable to offer even the Artifical Intelligence(AI) solutions that it claims to be built on. While chatbot systems falsely claim to be based on AI and more often than not provide irrelevant answers to visitors’ queries, Avazilla virtual agent conveys to the visitors the relevant messages that you pre-define. As such, the effect of Avazilla is highly superior to that of chat bots, as it is your Real Intelligence that is behind the success of Avazilla. Avazilla is not a live support software. No matter which method one would use to analyze in comparison the value for money Avazilla and live support offer, the benefit-to-cost ratio of Avazila will be always many times more than that of live support. Unlike live support systems, Avazilla does not require work force for its operation and maintenance. Live support is functional only as long as there is dedicated staff that oversees it. While Avazilla works 24 hours a day and 7 days in a week, live support systems require recruitment for many shifts to offer a similar around-the-clock service, which renders it a highly costly solution. If you think that you can not give up on your current live support system, it’s fine. You can keep your live support in place and let your Avazilla virtual agent work alongside it either simultaneously with your live support system or only during times that your live support is offline. As such, Avazilla is not necessarily a replacement for live support, but it is an excellent online marketing tool that fills the gaps that live support systems cannot address. It is a perfect complementary addition to your website. Thanks to Avazilla, I can now underline and emphatize parts of my website’s content that otherwise usually used to go unnoticed. Initially I was highly skeptical of Avazilla and didn’t think that it could make a big difference. But now I can see the increase in my website’s traffic and the rise in my sales. If you take into consideration the fact that incorporating Avazilla to my website was the only major change that I did recently, those better results that I now have can be attributed to Avazilla only. There is no doubt that Avazilla contributed a lot to the increase in our online sales and profitability. What makes us 100% sure about its great contribution to our business is the stream of never-ending positive feedback that we receive from our customers about Avazilla. It’s clear that they love Avazilla. Being a person with an educational background in cognitive psychology, I had only very little doubt that such an online marketing tool that is based on cartoons could have limited or no effect. And the yields that I have now after only a few months prove that I wasn’t wrong in trusting the powerful effect of cartoons on humans which I always believed in. And now, even this brief experience that I have had with Avazilla up to day made me believe more in the power of cartoons. It’s a wonderful way to establish rapport and interaction with the visitors of a website.